Welcome back to Study Skills – the video series that helps you pick up the skills you need to become a top-class distance learner. This time we focus on an area that is important to master if you want to improve your grades: learning from feedback. So you've submitted your assignment and got your grade – what now? 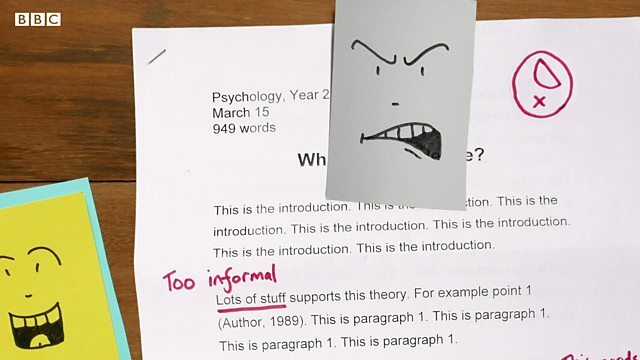 Whether you've got a good grade or not, your tutor has probably given you some feedback. How do you work with this feedback to make sure you get an even better grade in the future? Scroll down to watch the video and find out! 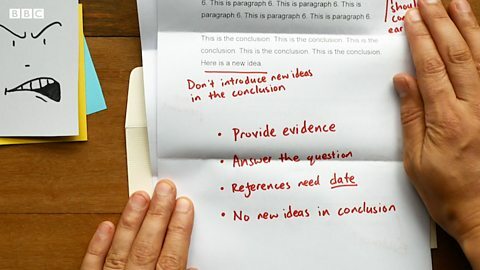 How do you learn from tutor feedback? It's only an envelope. But inside it is your essay – and grade. Will it make you happy? Or sad? There'll also be some feedback: that's useful. But how can you really learn from it and get a better grade next time? Watch the video to find out how to get the most from tutor feedback. While you watch, listen out for 1) the different AREAS of your work that a tutor might comment on, and 2) QUESTIONS to ask yourself about your tutor's feedback. Write them down if you like: you can check your answers – in an activity – later on this page.. It's only an envelope. But it's not only an envelope, because inside it is your essay – and grade. Will it be…? Or…? And hopefully not… Ah. Not pleased? Oh wait, there's some feedback: that's useful. But you're not quite ready to read it. Never mind. Put it away for the moment and read it at your next study session. OK? Ready? Time to take a good look. Feedback that tutors give after assignments is usually about: academic things like understanding the concepts, showing evidence and evaluating information; it can be about structure, style and technical things like spelling and grammar. And sometimes there’s some general feedback or a summary at the end. So, what to do with all this feedback? Well the first question is: do you understand it? If not, make a note of what you don't understand. This is something you can email or call your tutor about. Or you can chat to your online study group. Next question: do you agree with it? If not, again, you can contact your tutor or ask your online study group. Now remember, if you're a distance learner, your tutor can clarify their feedback by email, video calling or messaging online. Make sure you get everything cleared up. Most importantly: what have you learned from this feedback? Ask yourself: what steps can you take to solve problems and improve? You should choose at least one thing from the feedback that you’ll act on. And keep the feedback safe, so you can refer to it later. We asked you to listen out for the different areas of your work that your tutor might give you feedback on. Try this activity to check you've understood it all! You need to include the author's name and the date of publication in in-text citations and the list of sources at the end of your writing. Check the letters of all the words you write down! Make the most of feedback! If you want to develop academically, you need to act on the feedback your tutors give you. Let's review the seven things we've learned about improving your future grades with feedback. If you feel sad or angry that your grade isn't as good as you had hoped, put the feedback to one side and come back to it when you're cool and calm. Tutors give feedback on many different academic areas: from understanding concepts and showing evidence to technical things like spelling and grammar. Make sure you read all the feedback given to you so you don't miss anything out – there's usually a summary of the main points at the end. Ask yourself questions about the feedback: do you understand it? If not, get in touch with your tutor or ask other students on your course for advice. Do you agree with the feedback? If you don't, discuss it with your tutor or online study group. Contact your tutor to clarify their feedback – you may be able to discuss things with them via email, video calling or online messaging. The most important thing is to make sure you use feedback to improve – choose at least one thing from the feedback that you'll act on in the future. For more information on Study Skills, scroll down and click on the links in the 'Where next?' section.